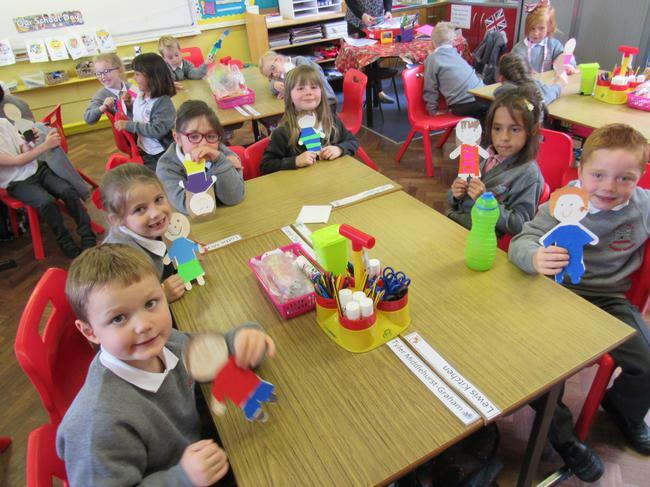 Welcome to our P3 class! 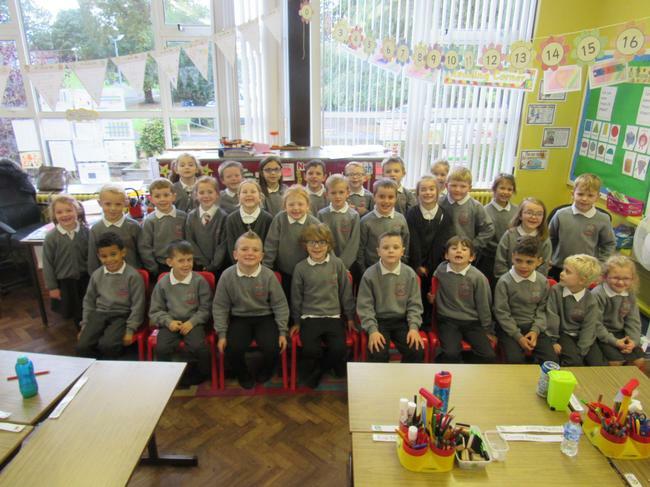 Look at us all ready to learn! 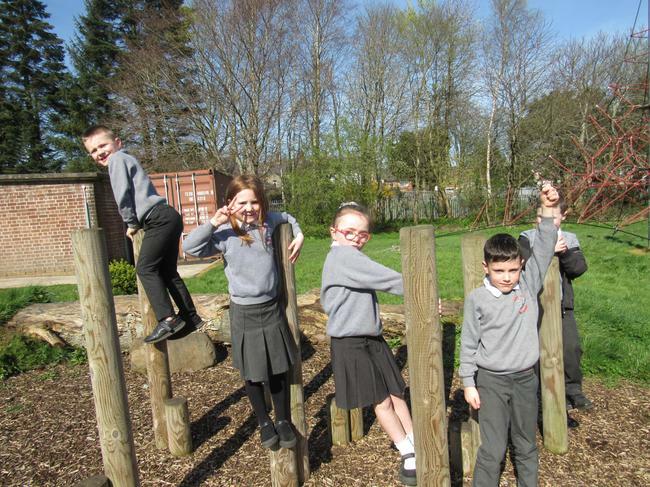 The sun has been shining and we have been outside enjoying physical activity. In Fort Fun, we run, jump, climb and slide! All of these activities help us develop our big motor skills. Our teachers encourage us to get outside at the weekend and do lots of physical activities! Click on the star below to see some more photographs. 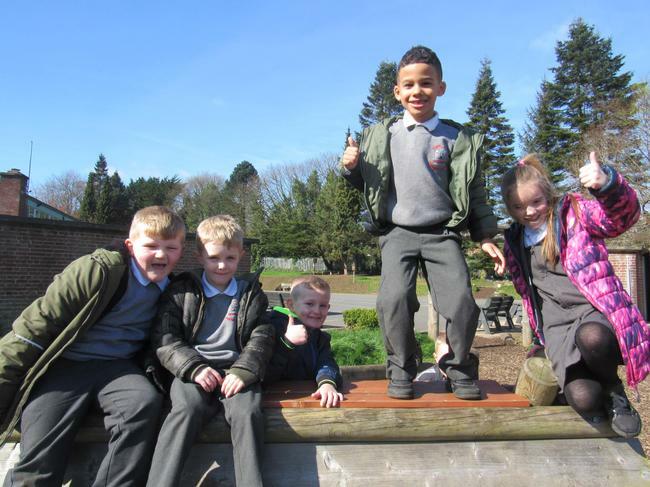 Sunny Days in Fort Fun! 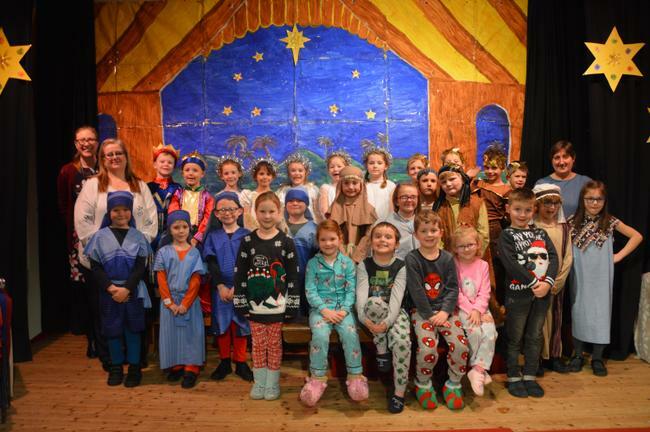 The Key Stage children have been practising for their show, "Aladdin." We got to go and watch their dress rehearsal. It was fantastic. Some of our brothers and sisters are taking part. After the show, we decorated a genie lamp and wrote about what we would wish for if we had three wishes. 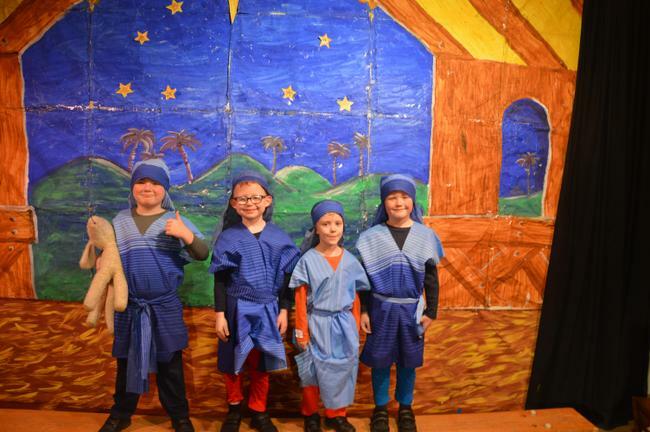 As an Integrated School we enjoy learning about different religions and celebrations. We had a special assembly where we learned about Shrove Tuesday and Ash Wednesday. 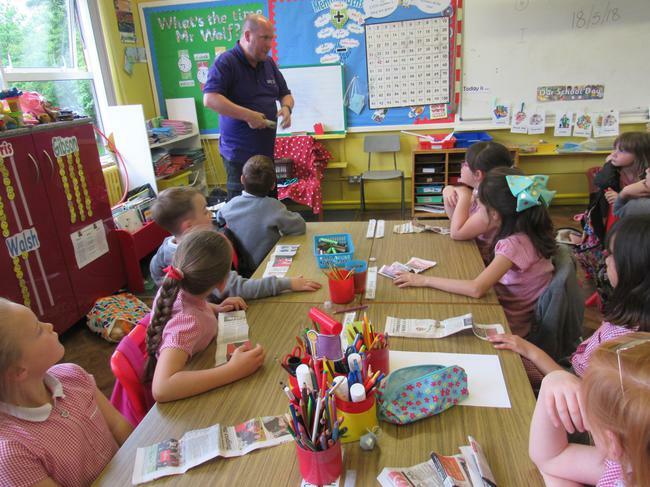 In class, we learned about the Easter story and how it is important to Christians. We found out about how Easter is celebrated around the world. In Scotland people roll eggs down a hill to remember how the stone was rolled away from the front of Jesus' tomb. We found out that in Bermuda, people fly kites at Easter to remind them that Jesus rose again. We made our own kites and decorated them with Spring pictures. 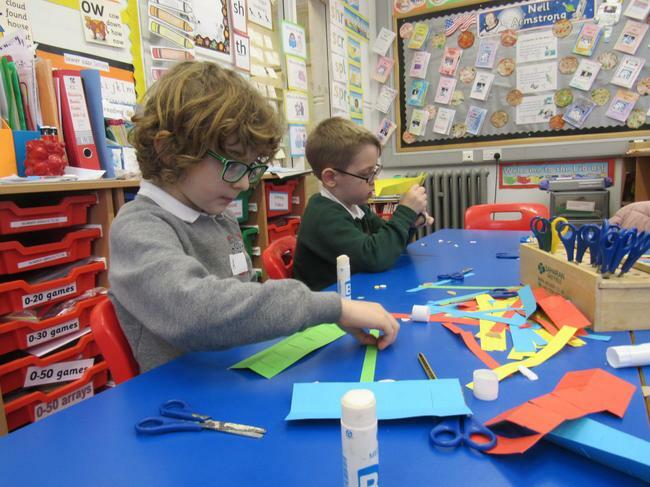 Click on the star below to see us working together to make our kites. 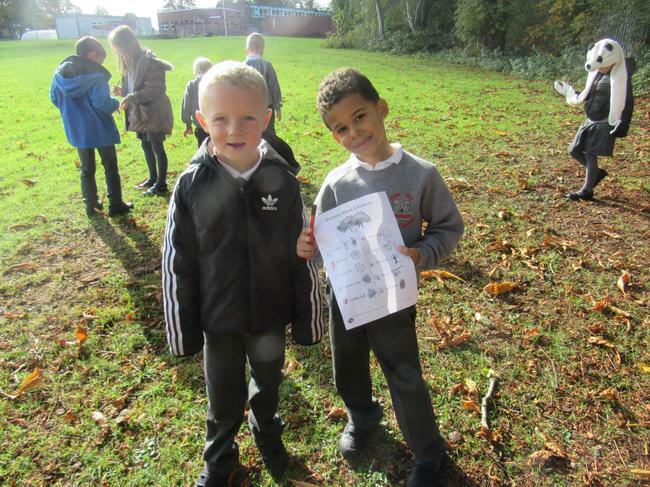 In March we walked to Brownlee Primary School to enjoy learning alongside our Brownlee friends. We shared non-fiction books in the Library and we made book marks with their teacher. 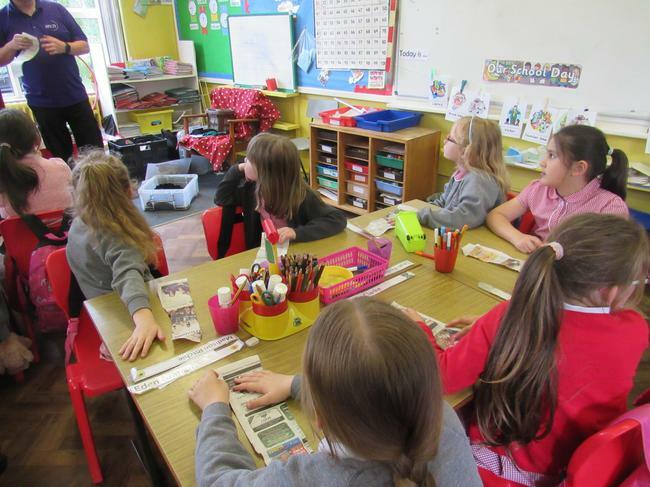 We talked about the different types of books we like and Mrs Johnston read us some stories. 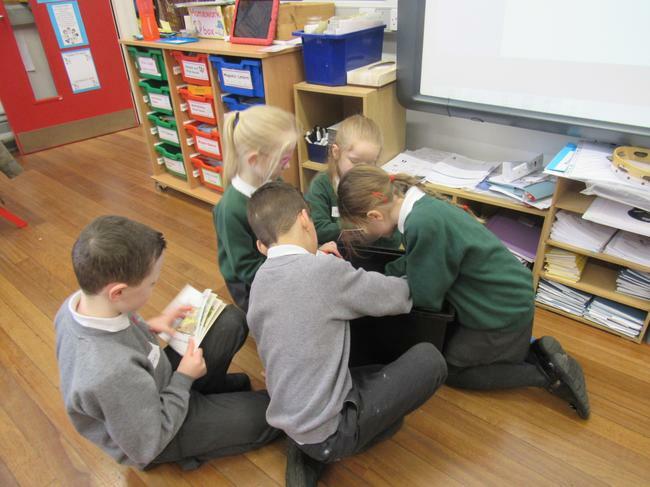 We also enjoyed 'buddy reading,' where we read to each other. We also got to play in Brownlee's playground. Can you guess what we are singing??? It was lots of fun! 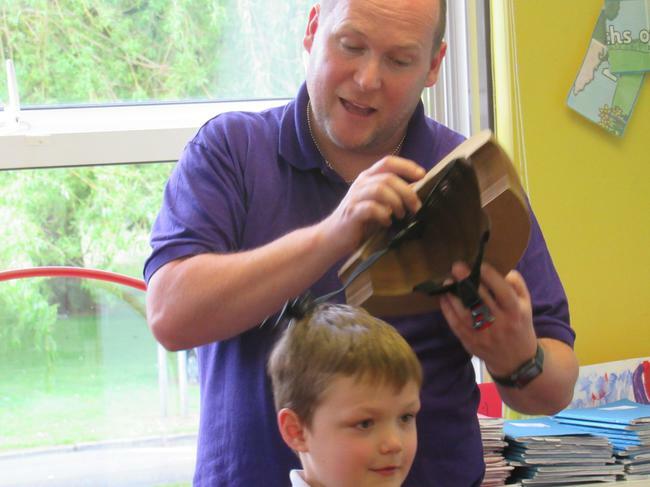 On Thursday 7th March, we celebrated World Book Day. We dressed up as our favourite book characters and had a special assembly. 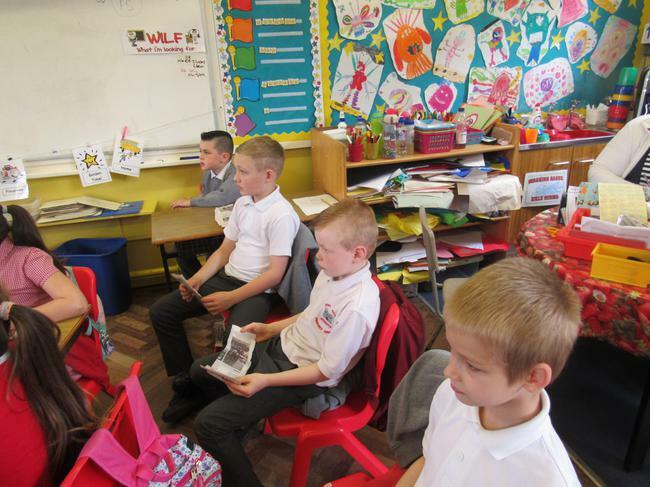 We also did lots of 'World Book Day' activities in our class. 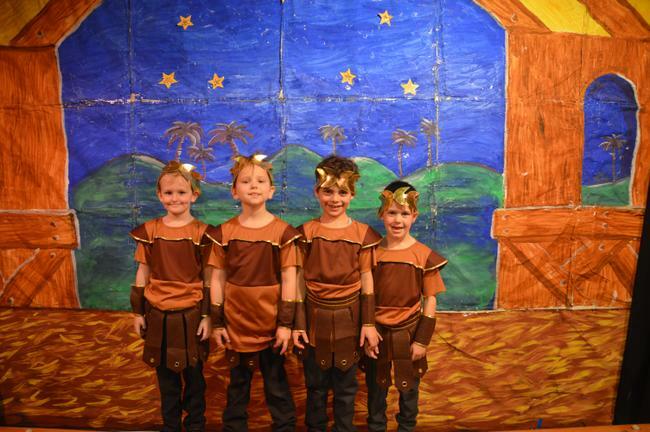 Click on the star below to see us dressed up in our fantastic costumes! 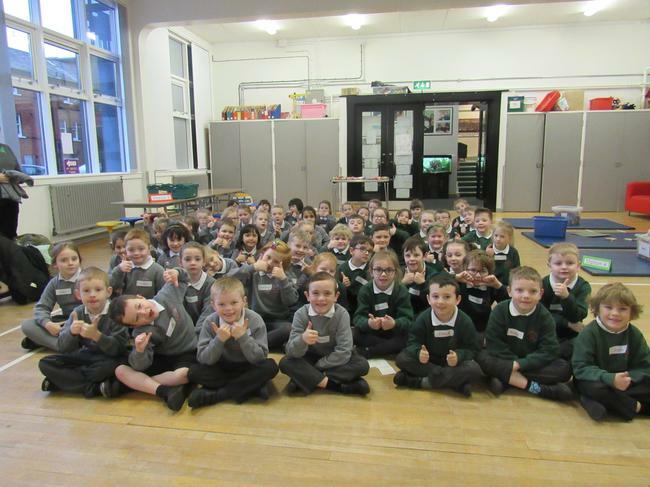 We had our P3 assembly in February. We shared some of the space facts we have been learning in school. We have been thinking about how HUGE space is, and all the amazing things there are in the world. We explored HOW AMAZING each one of us is. We each shared something we are good at. 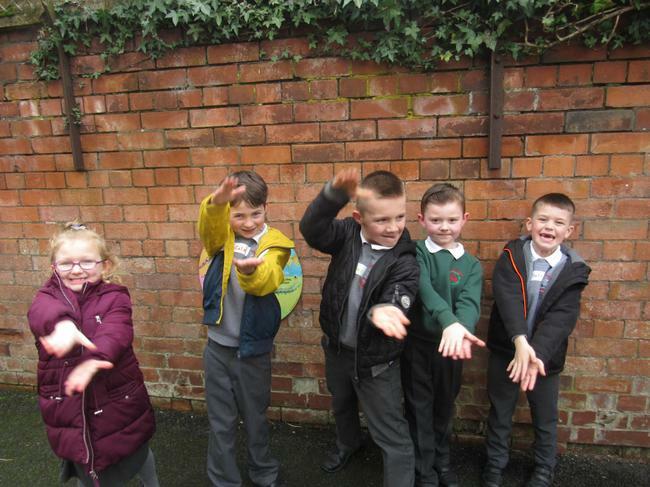 We were learning to tell the time with Miss Tipping. We used the Interactive White Board and we played some games together. Click on the star for more 'time' photographs. 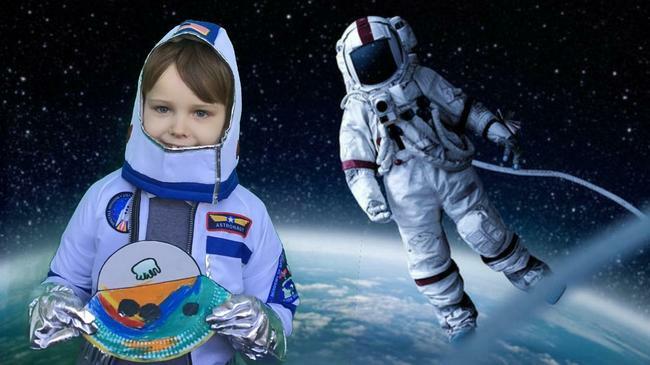 Our topic this term is Space. We all shared what we know about space. Then we discussed what we would like to find out. We are learning to use non-fiction books and the internet to help us find out facts and information. 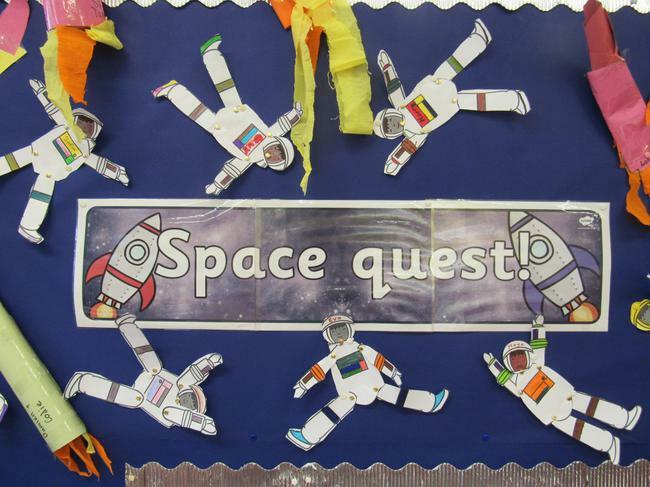 Over half term, we worked with our families to make some amazing space creations. These are on display in school. 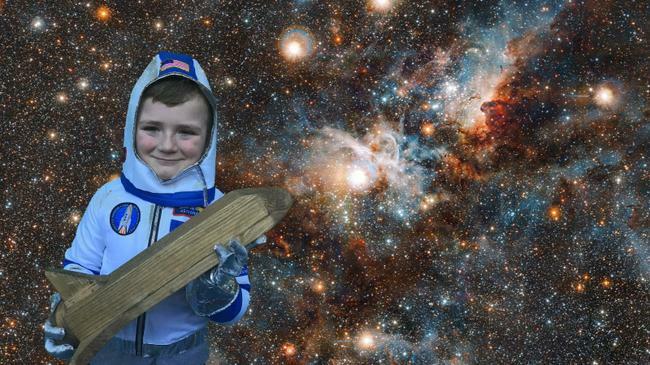 We also took photos using a 'green screen' app on the Ipads. It looks like we are actually in space! Click on the star below to see even more! In ICT, we use Black Cat Logo to do programming. There are some cool space- themed backgrounds and we have been experimenting with giving instructions to move a rocket around the screen. 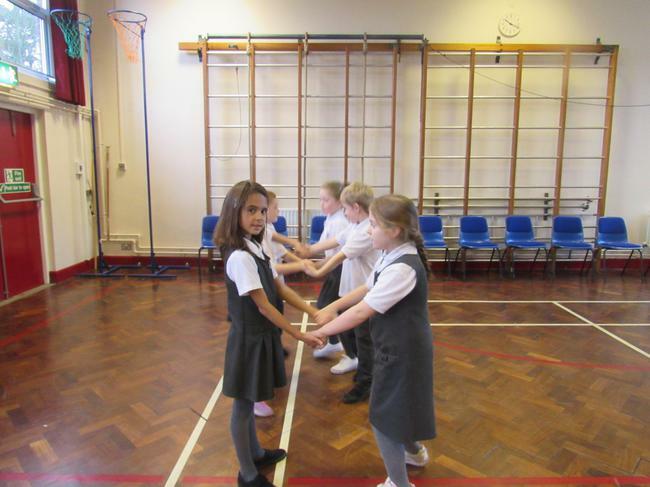 We are also learning to work in pairs, give and follow instructions and to help each other out. Click on the star below to see photos of us learning. 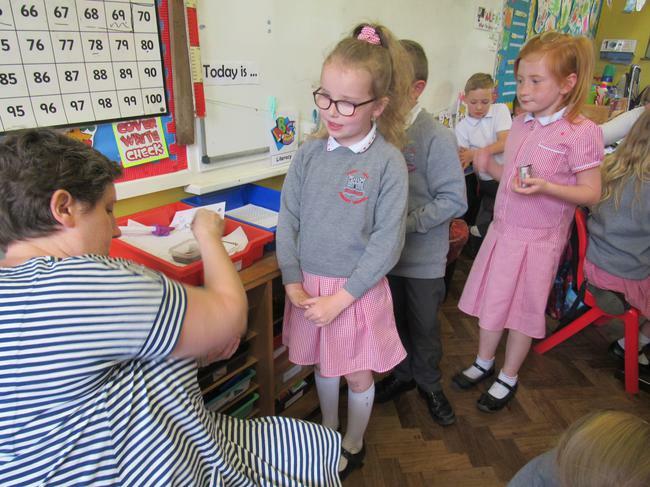 Click on the star below to see more photos o us learning. We have been focusing on 'Working Together' this half term. We created snow globe paintings to show a winter scene. We also wrote winter poems. 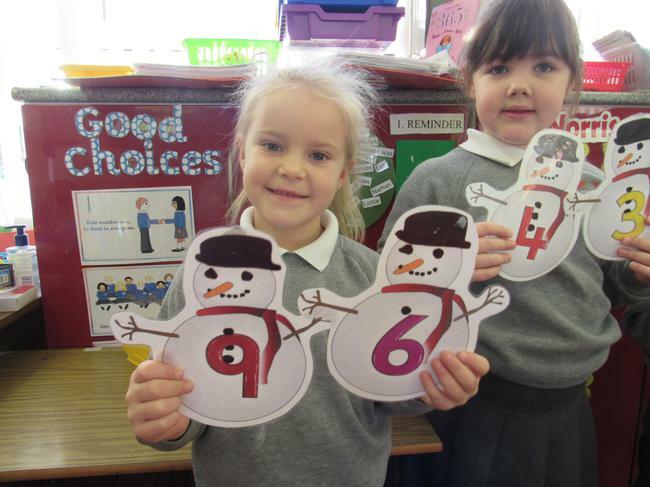 We created snowmen using lots of different resources. We used paper plates and tissue paper, paint and markers, and pastels. Lots of our work has been on display around our school. On Wednesday 19th December, we walked to Brownlee P.S. to spend a morning learning with our friends. We played Christmas-themed team games where we had to work together. We also worked with a friend to create Christmas decorations. We enjoyed having our snack together. Click below to see some shared Christmas Fun! Click on the star below to see more pictures of us getting ready, on stage and having our photo shoot at the end! 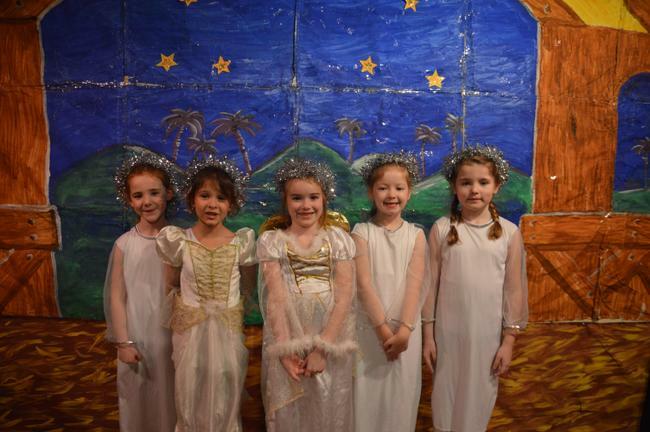 Here are some photographs of Nursery, Primary 1, Primary 2, Primary 3 and the Choir. We explored the grounds around our school. We looked at different trees and their leaves. We talked about how they change in Autumn. 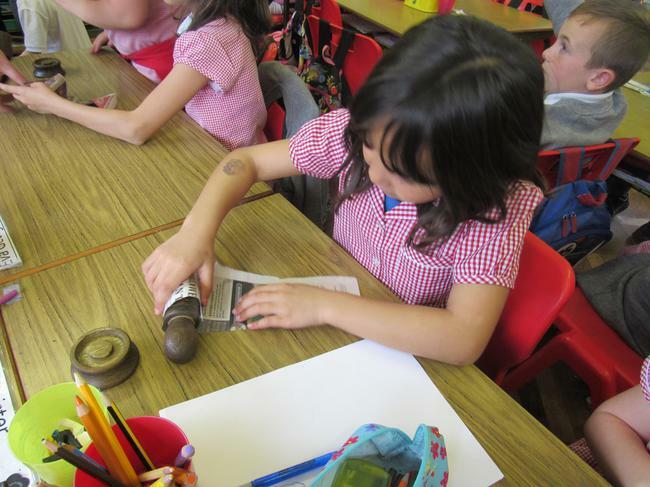 We found different seeds such as conkers, acorns and sycamore keys. 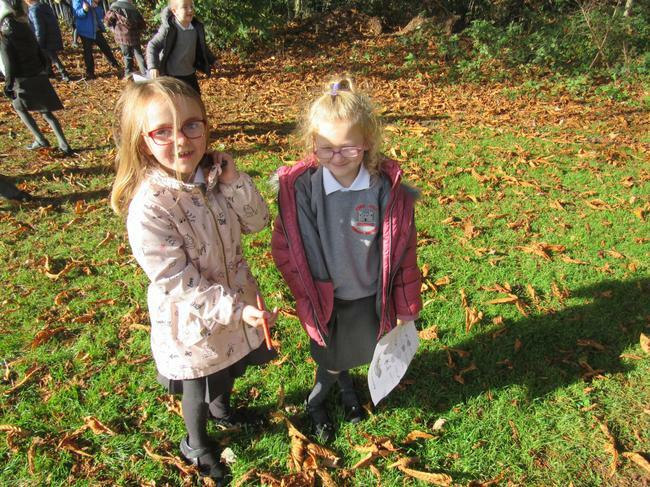 We worked in pairs to find lots of Autumn things. 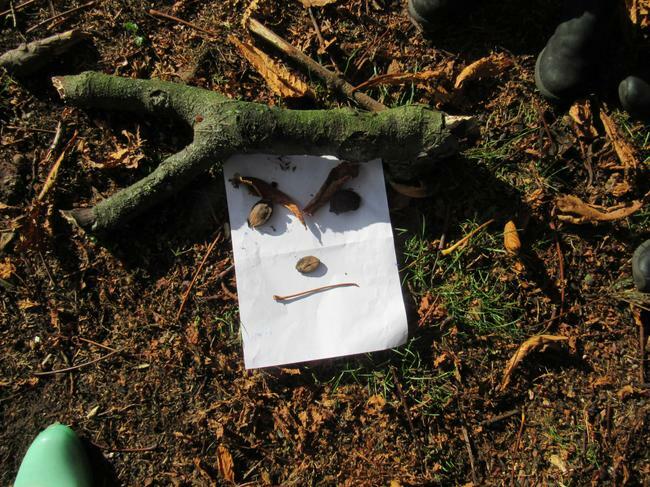 We then used these natural materials to create outdoor art. Doesn't this face look fierce? Click on the star below to see more pictures. 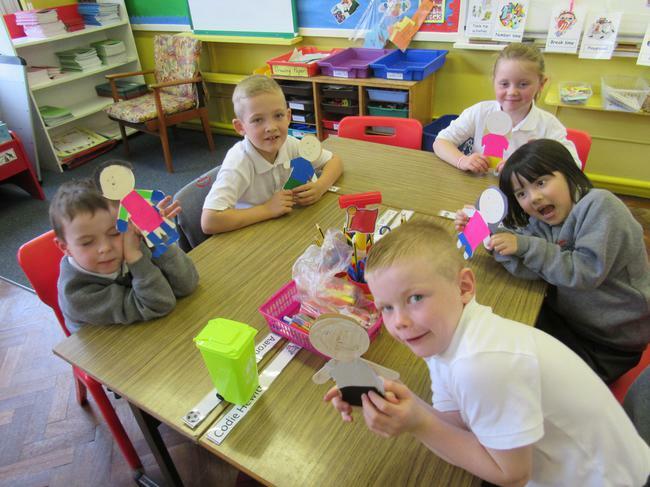 In P3 we have lots of fun learning in different ways. We have been learning about 2D and 3D shape. 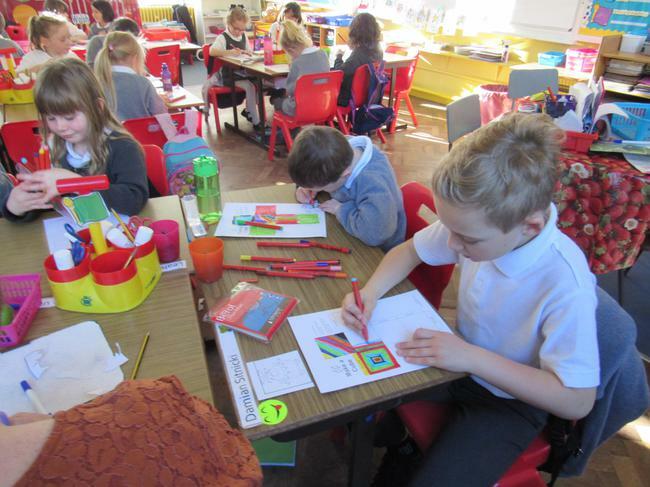 We have been drawing and painting to help us remember the shapes names and properties. 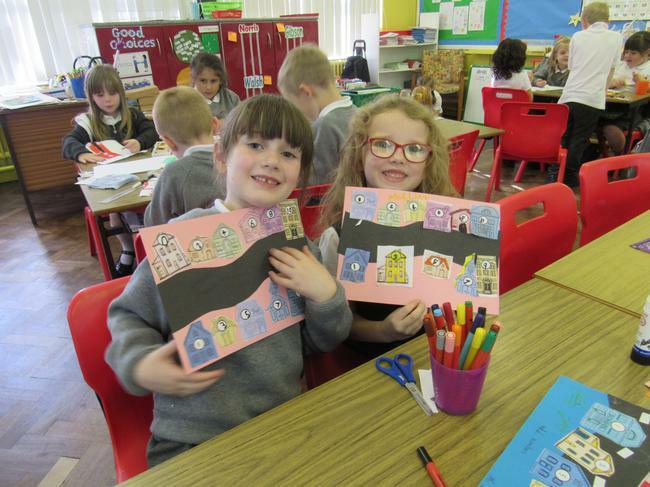 Our topic this term is Houses and Homes. We have also been doing some science experiments. We have been testing which materials let light pass through. We have been thinking about predictions and fair tests. 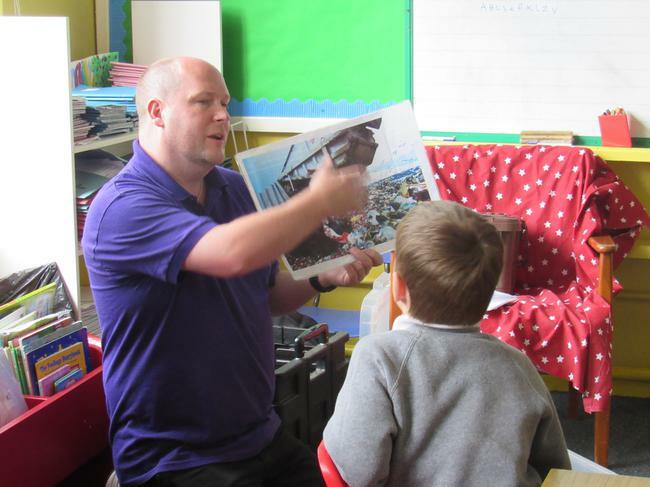 Click on the stars below to see some photos of us learning together. 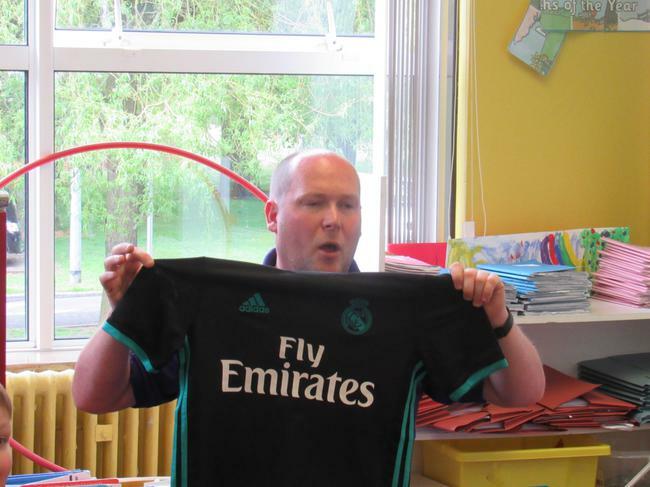 and see what last year's P3 class got up to! 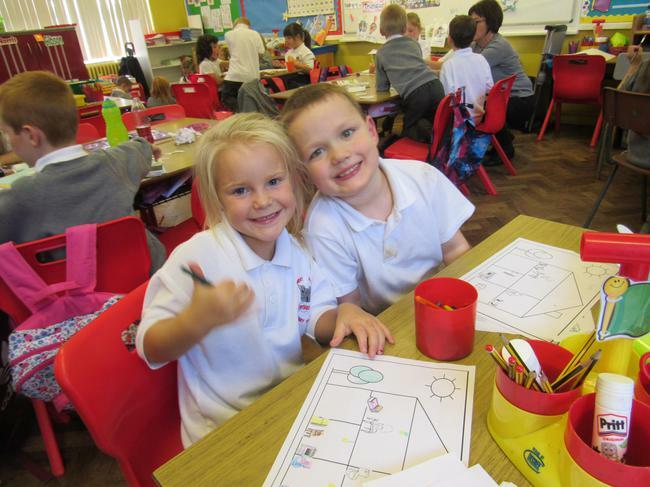 We have been having lots of fun learning in school. We have been practising our races and then we enjoyed Sports' Day. 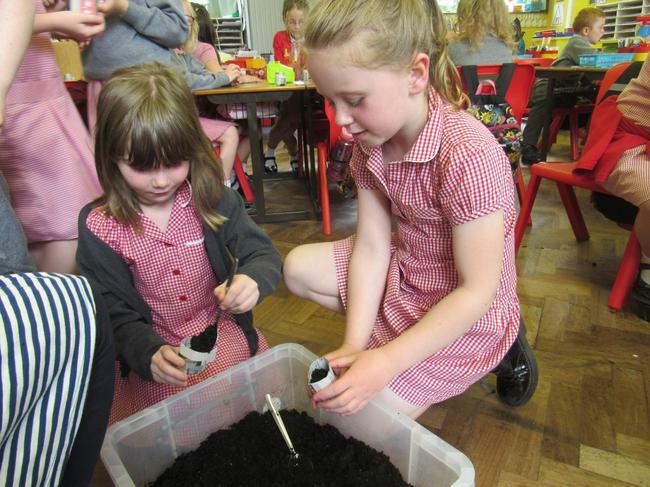 We also have been learning about planting and growing. Some boys and girls went to plant at the Low Road Community Garden and some of our class worked in the poly tunnel. 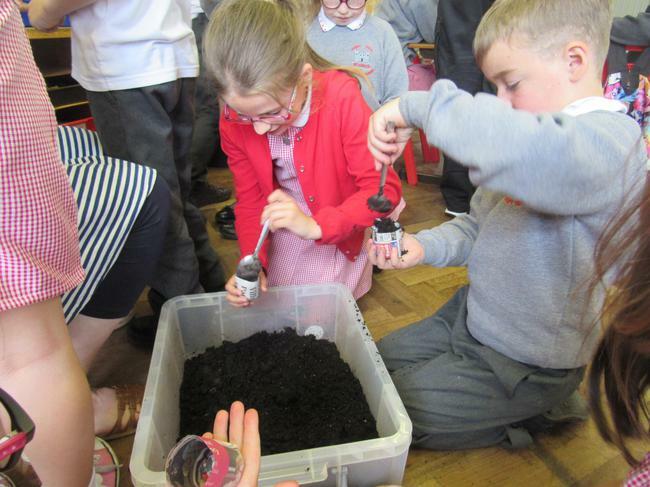 We all had great hands-on learning! 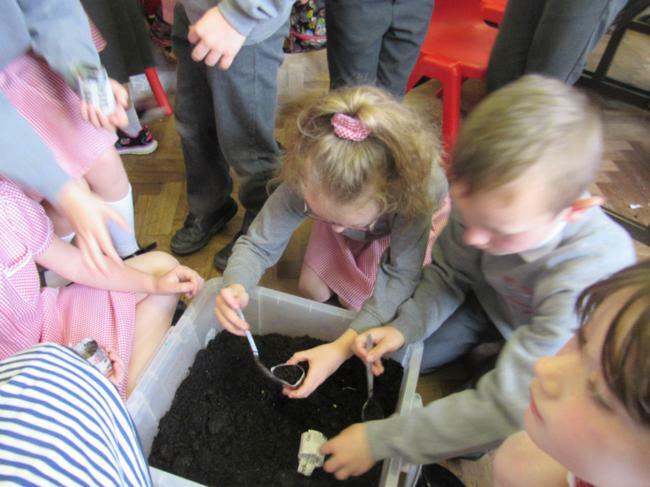 In Explorers, we have been building dens, making maps, finding treasure, creating nature pictures and learning about the plants, animals and birds that live around our school. Check out the stars below for some pictures. On Friday 18th of May we had a visitor. 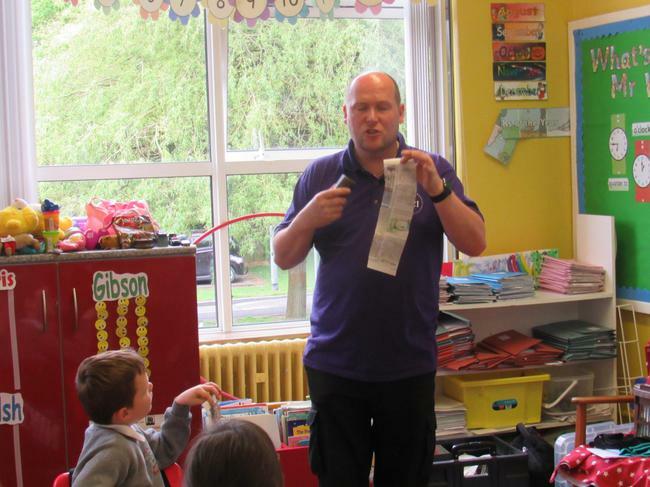 He came to our class to talk to us about recycling. It was amazing to see all the different objects that were made from various materials that had been recycled. 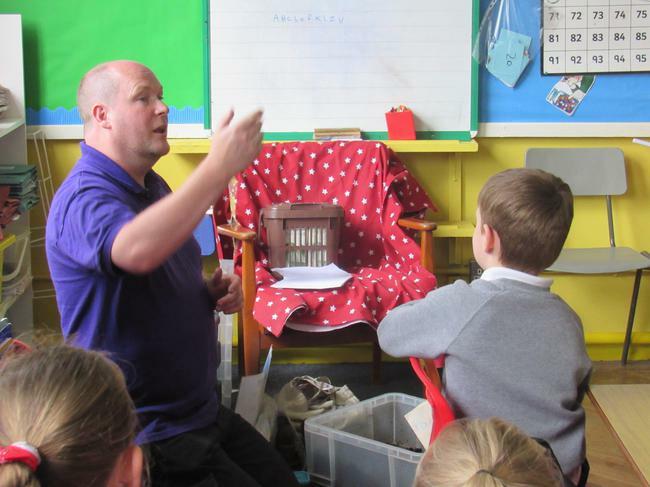 He also talked about what goes into each bin but we were very clever and were able to answer all his questions. 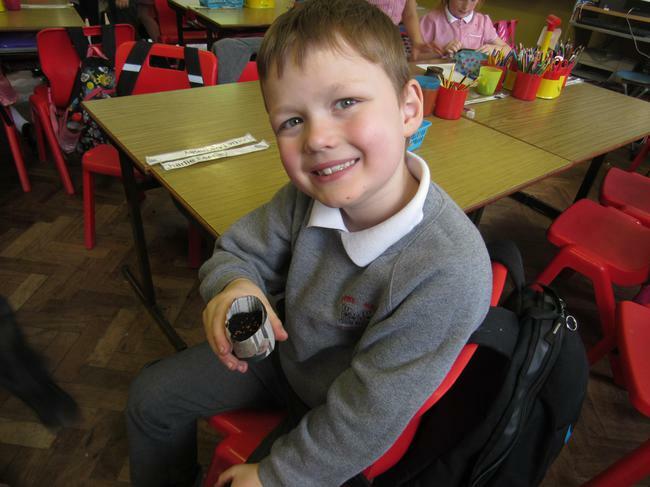 We then made paper flower pots and planted some cress seeds. Now all we have to do is water them and watch them grow! To celebrate World Book Day we joined our friends from Brownlee PS. We explored non-fiction books in their library. We made book markers with lots of stickers and cool quotes about reading. 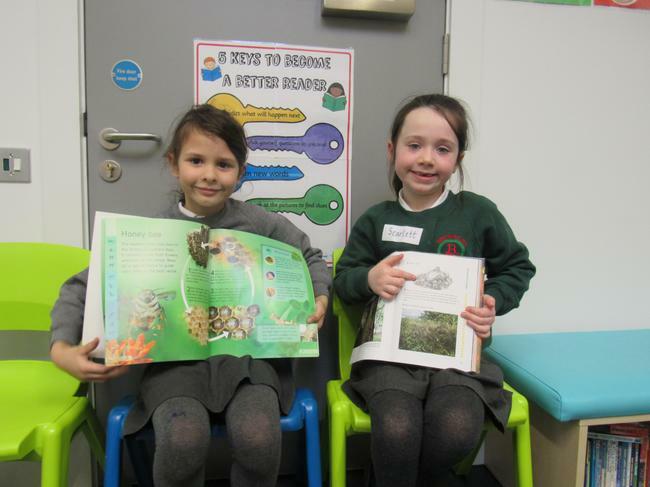 We enjoyed shared reading. 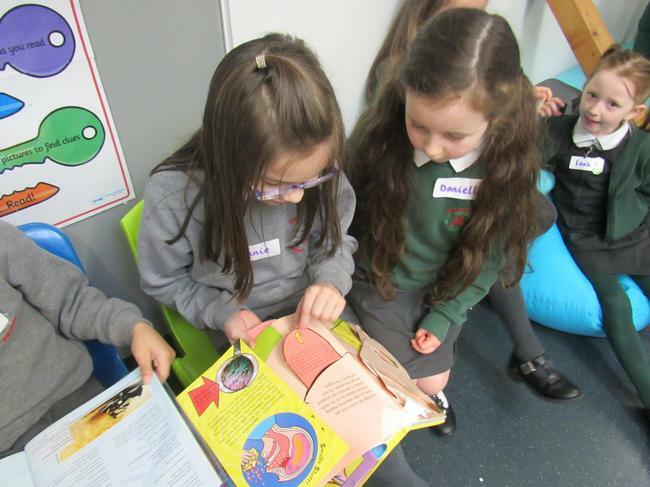 Our favourite activity was 'buddy reading' with our friends. We have started our new topic. 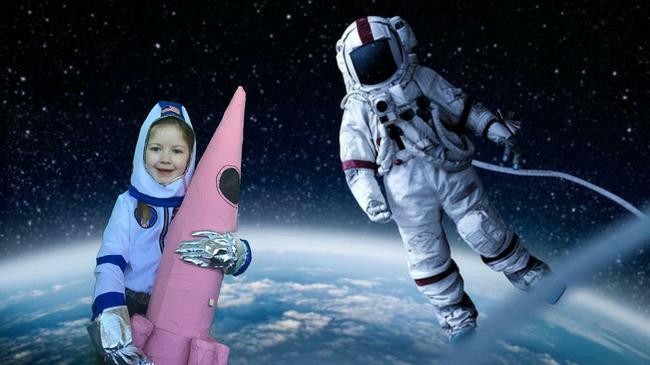 This term we are learning lots about Space. In Activity Based Learning we have been practising some technology skills. 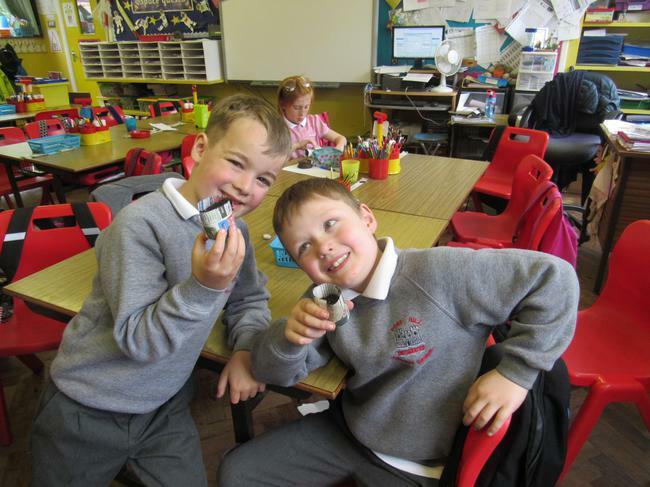 We have been making astronauts with moving parts. 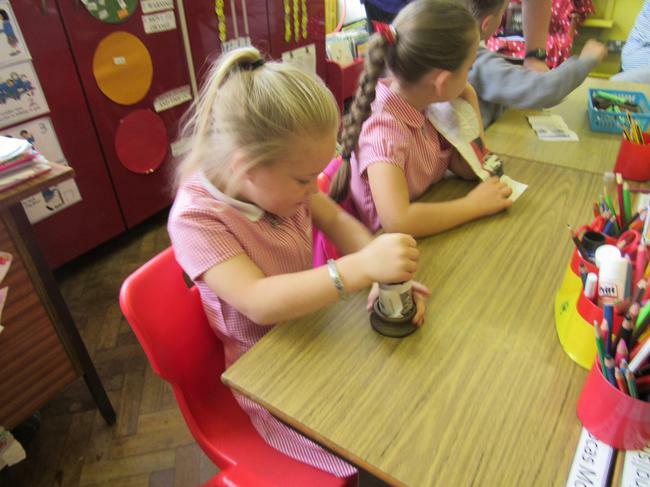 We have also been creating rockets. 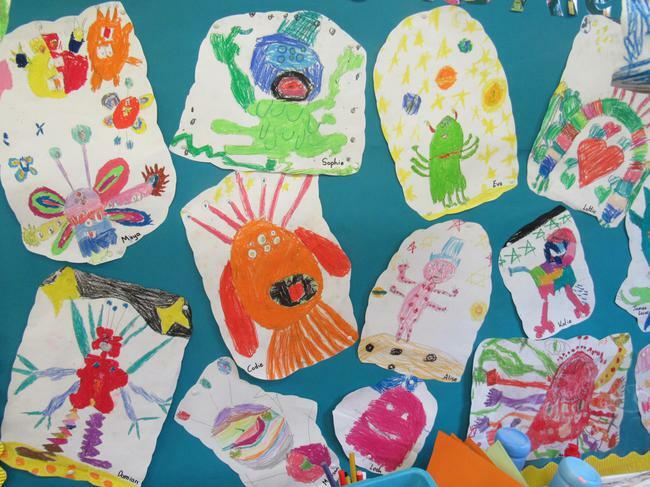 With Miss Tipping we drew alien pictures using pastels. We then wrote descriptions of them. 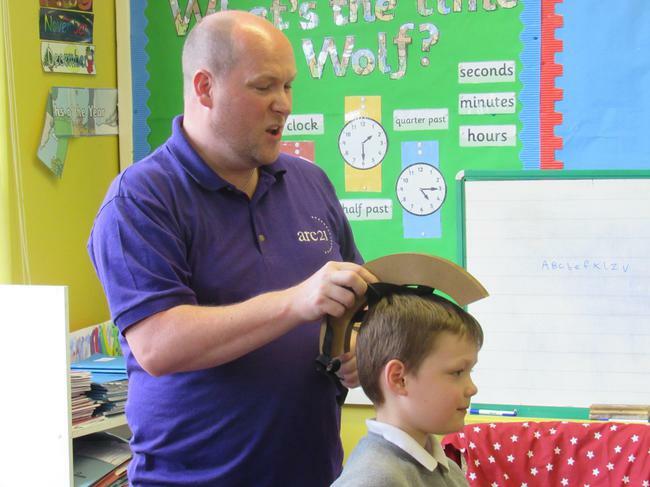 Click on the star below to see photos of us engaged in lots of hands-on learning! 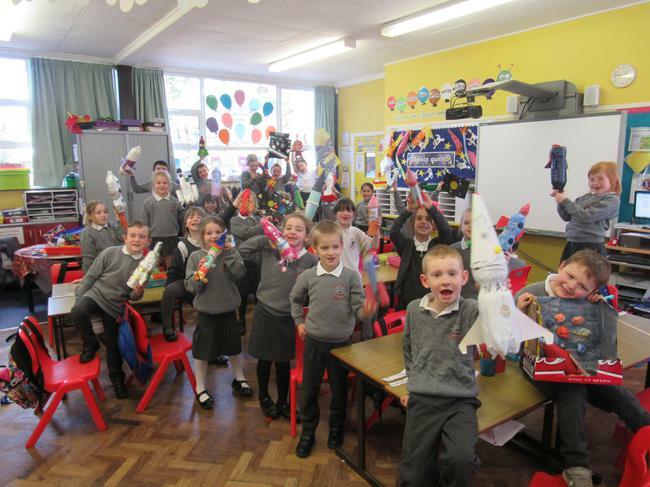 Over half term, we worked with our families to design and create 3D space rockets using junk materials. We had fun showing them to our classmates and sharing how we made them. We have used them for lots of 'Talking and Listening' activities in class. Click on the star below to see our creations! 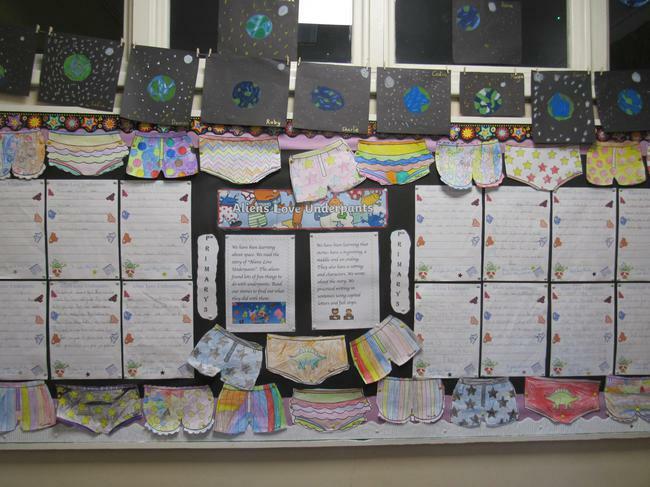 Miss Tipping read 'Aliens Love Underpants.' We enjoyed rewriting the story. Then we designed some pairs of underpants - it was lots of fun! 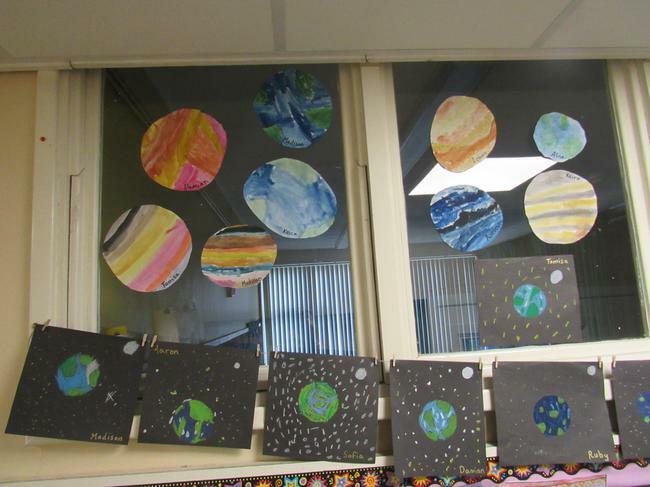 We used pastels to create pictures of planet Earth. We experimented with mixing water colours to create some really fantastic planets. 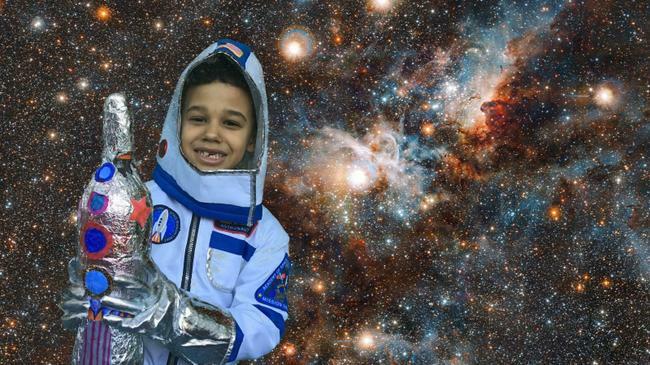 When we have been learning about Space, we have discovered that we all learn in different ways. Some of us are visual learners - we learn by looking and remembering what we see. We have drawn mind maps and doodles to help us remember facts. Some of us are auditory learners - we learn by listening and remembering what we hear. We have been learning some songs and rhymes about the solar system. Some of us are kinaesthetic learners - we learn by moving and doing. We have made actions to help us remember information. We enjoyed learning about Shrove Tuesday, Ash Wednesday and Lent. 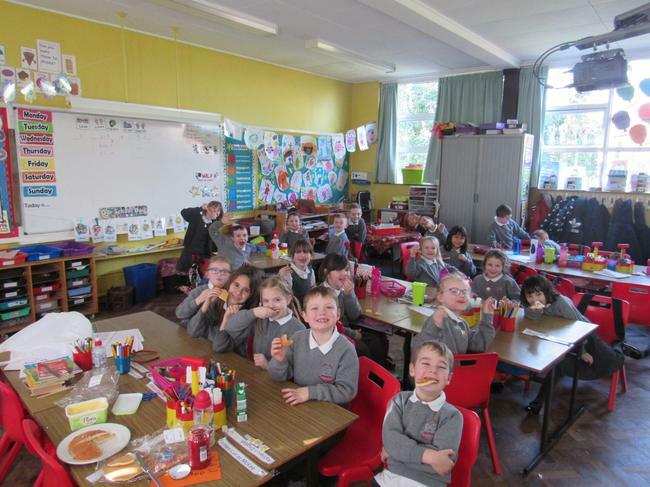 We especially enjoyed the pancakes !!! 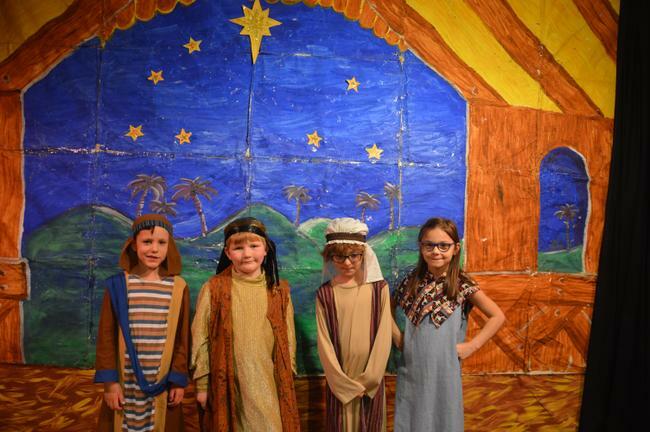 Click on the star to see some more photographs. We talked about New Year's Resolutions. 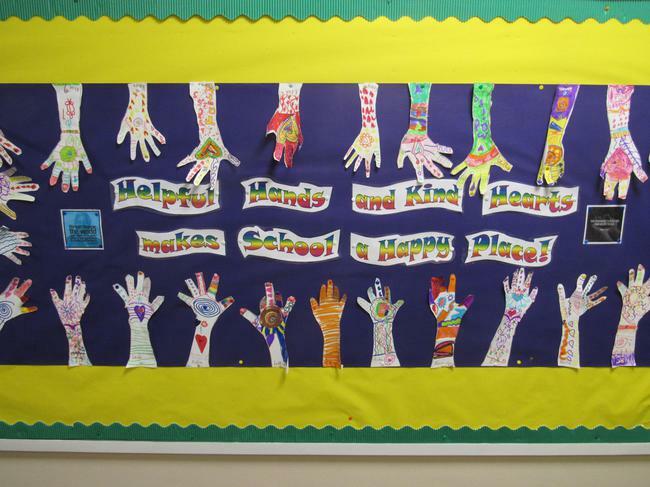 We designed colourful hands and put these up to remind us to have helpful hands and kind hearts! P3 - Getting ready for Christmas! 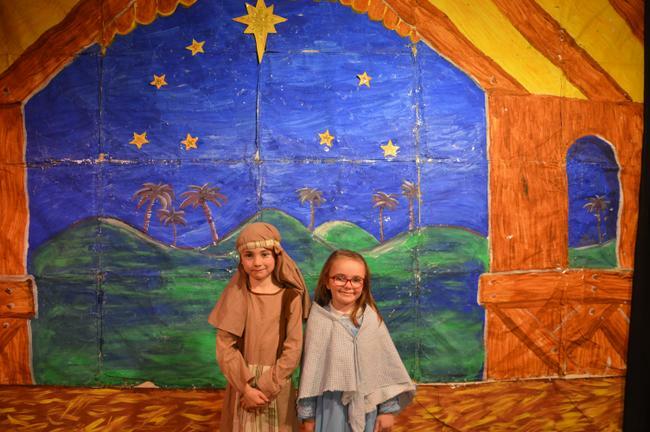 We have been rehearsing for our Christmas show. We sing, dance, act and play instruments! In P3 we have been VERY busy getting our school ready for Christmas! 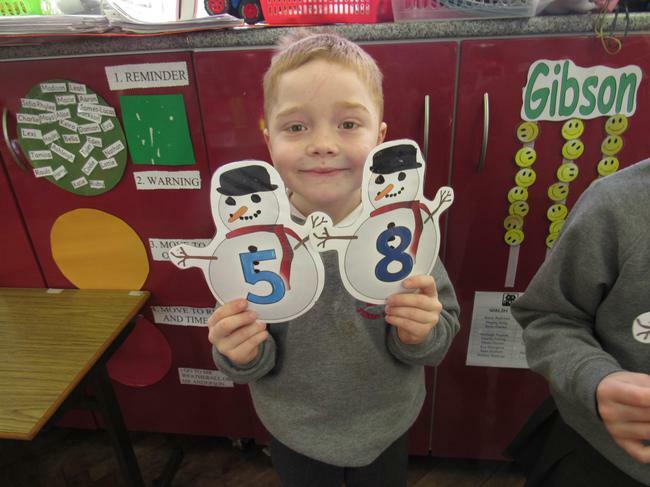 We have been making and painting lots of different types of snowmen. 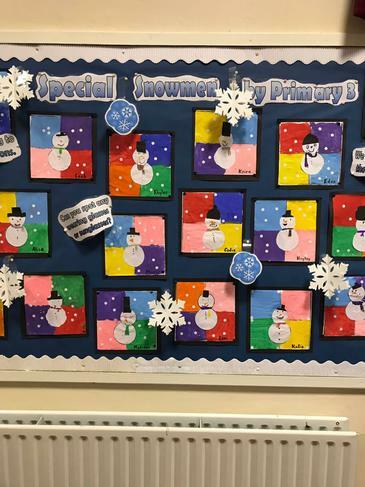 We painted squares different colours and then designed out snowmen figures. They all started the same but when we had finished, they all looked different. All different and all special, just like us ! We also painted white snowmen on black paper. They are looking up at the sky, watching the snow falling. Come back soon to check out our other Winter displays. We have drawn Rudolph the Red Nose Reindeer. 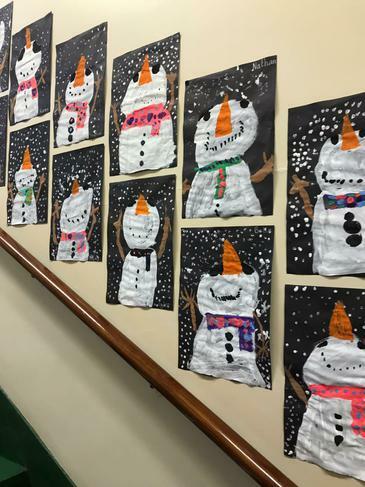 If you pop into school, make sure to look UP... Lots of our snowmen are hanging out in the foyer ! In December we joined with our peers from Brownlee PS. 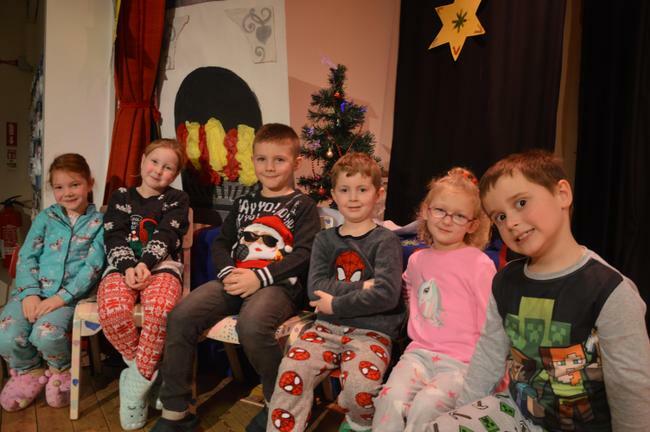 Our teachers had planned lots of learning opportunities based on Winter and Christmas. We have been learning about 3D shapes in Topic Maths. We made cubes from a net, decorated them and created a jack-in-the-box. We have also been learning about Tens and Units. This has helped us write our numbers correctly and we are now learning to add much bigger numbers. We had a special assembly to mark St. Andrew's Day. Mrs Jones taught us about the Scottish flag and why St. Andrew is the patron saint of Scotland. Children from the P4 class and Scottish Dancing Club performed a few Scottish dances which they have been learning this term with Lucy. As a special treat, we got to have a Scottish Dancing session with Lucy. It was lots of fun and we learned some new steps and routines. Click below to see some more pictures of us - we are blurry because we were dancing quickly ! Sponsored Sports with Fitness Freddy! 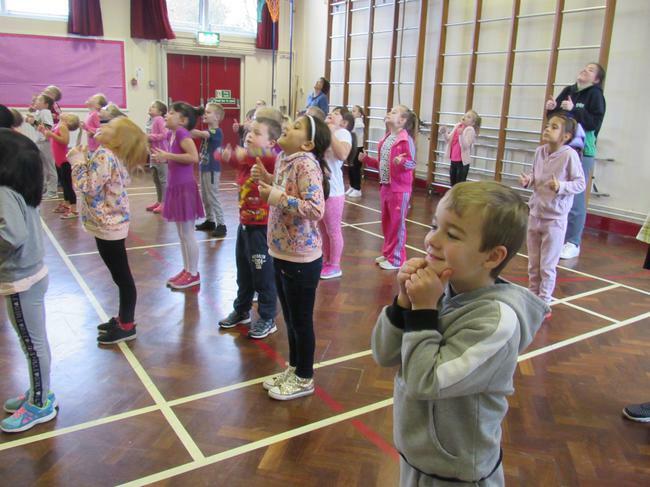 In November we raised a MASSIVE £1864 for 'Children in Need' by doing Sponsored Sports with Fitness Freddy. 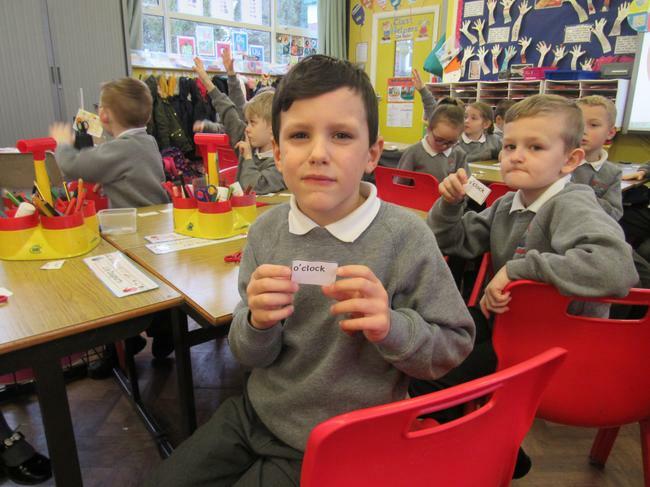 In P3 there are lots of VIPs - Very Important People! We have two teachers. Mrs Johnston teaches us on Mondays, Tuesdays and Wednesdays. Miss Tipping teaches us on Thursdays and Fridays. Mrs Dennison is our Teaching Assistant. She is with us every day. Mrs Elliott also joins our class to help us with Literacy and Numeracy. In Fort Hill Integrated Primary, we are encouraged to celebrate diversity! In August we explored how we are ALL DIFFERENT but we are ALL SPECIAL! We made 'character collages' to represent ourselves. We talked about how we all have different colours of hair, eyes and skin. We all like different colours, different clothes, different subjects, different animals, different toys, different stories and different programmes. DIVERSITY is to be celebrated... If we were all the same, the world would be a very boring place! Our topic this half term is 'Houses and Homes.' We have been learning about this through lots of different subjects - Literacy, Numeracy, ICT, Art, Music and even PE! 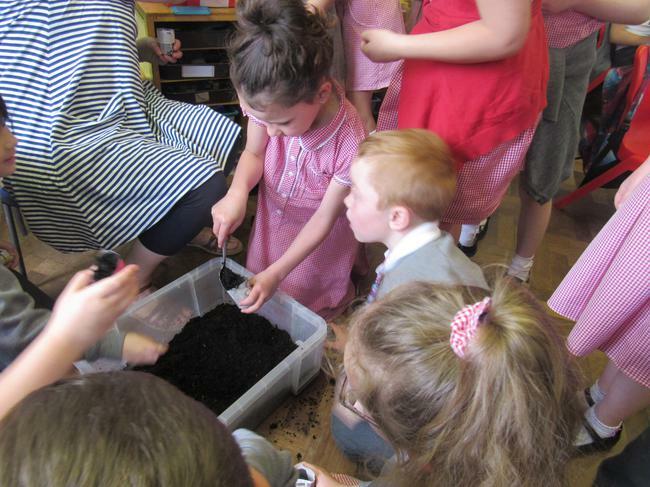 During Activity Based Learning, all of our activities have been linked to 'Houses and Home.' 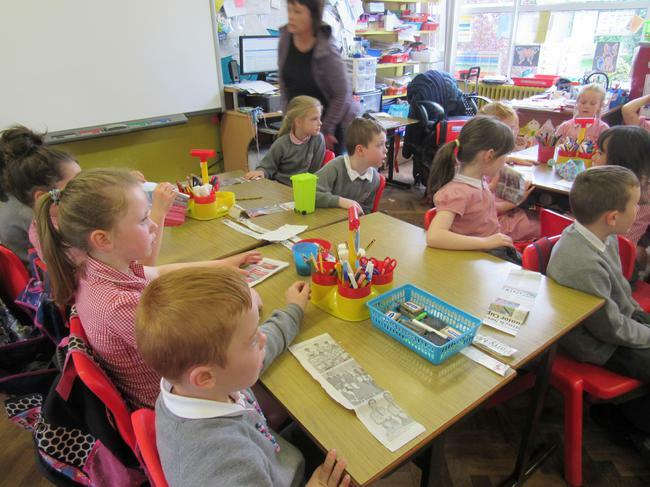 Here are some photographs to show what we have been doing and learning. 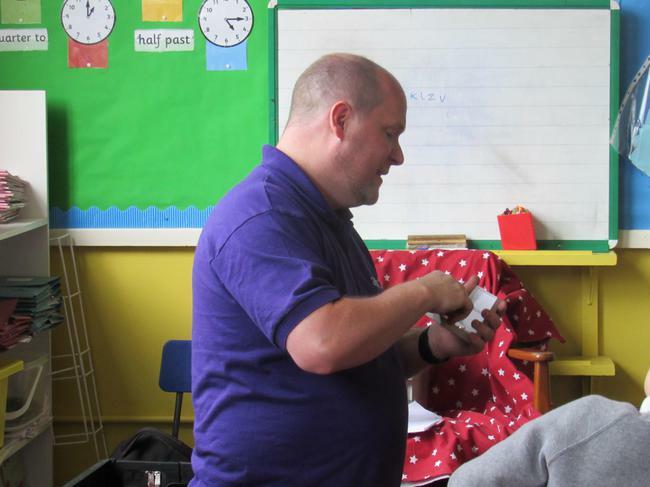 Click on the star below to see some more photos of us learning. 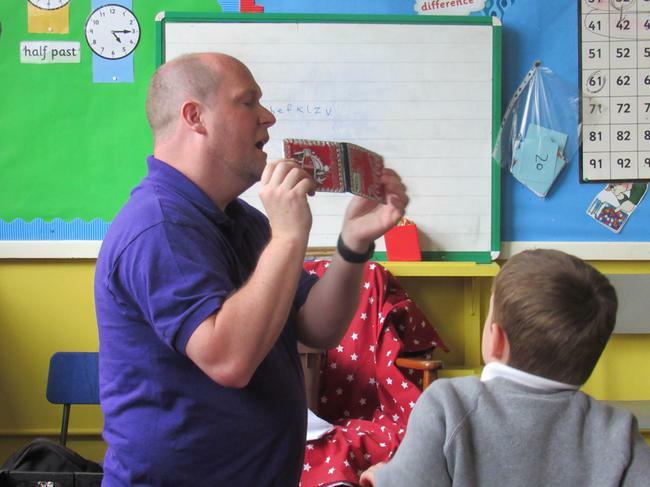 In Music, we have had great fun creating sound effects to accompany the stories. We have also been learning building songs. In ICT, we used 'Colour Magic' to create pictures of different types of houses - detached, semi-detached, terraced houses, bungalows and blocks of flats. We printed and saved our work. We put it up on the wall so everyone could see!